The Environmental Quality Incentives Program (EQIP) program is administered by the USDA Natural Resources Conservation Service, and is available in all states and all counties. The program provides assistance for new and existing organic producers to implement conservation practices new to their farm, including conservation crop rotations, cover cropping, nutrient management, pest management, prescribed grazing, and forage harvest management. 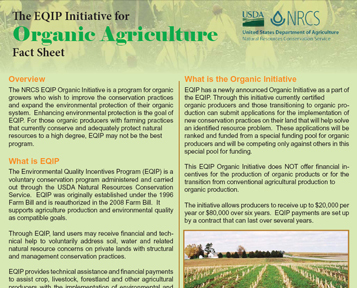 The 2012 EQIP Organic Initiative provides financial and technical support to help producers plan and implement conservation practices to support their organic operations in being more environmentally sustainable. EQIP applications are accepted continuously, with deadlines established for individual "rounds" of funding. Applications submitted after the deadline are held for the next round. Contact your local District County office to verify the application deadline in your state. The intent of this initiative is to help organic growers incorporate new conservation practices into their farming operations. Producers participating in the Organic Initiative are limited to financial assistance up to $20,000 per year and a total of $80,000 over a 6 year period for implementing conservation practices. EQIP payments are set up by a contract that can last several years. Payments are made for the adoption of new conservation practices and in some cases, the enhancement or improvement of existing practices. Certified organic producers who have already been using organic and conservation techniques might not meet the criteria for new practice adoption. For these producers, the NRCS Conservation Stewardship Program might be an attractive option. Payments for the implementation of conservation practices are determined at the regional and state level. In most cases payments are by the acre but is some cases they are per farm or some other unit of measurement. Talk with your district conservationist to ensure that your contract reflects payments most appropriate for your farm. In many cases, organic payment scenarios are available that account for the higher cost of implementing conservation in accordance with the NOP rules. Make sure you understand what the costs are for practice implementation before signing a contract. Organic producers who are interested in conservation practices that will cost more than the $20K/$80K limits of the Organic Initiative may participate in regular EQIP. The competition increases, but the maximum payment could rise to $300,000 over a 6 year period. It could even rise to $450,000 if you can justify it as of a unique and significant environmental benefit. In addition to the usual contract requirements for EQIP, producers agree to develop and implement conservation practices for certified organic production that are consistent with an organic system plan per provisions established in the Food, Conservation, and Energy Act of 2008 (Farm Bill) and to standards established in the National Organic Program (NOP) Act (7 USC 6501-6522). For more information see the Self-Certification Worksheet that you'll be required to sign. If terms are not met, the EQIP program contract may be terminated and producers may be responsible for repayment of benefits received and possible assessment of liquidated damages. What kinds of conservation practices are eligible? Consult the 2012 EQIP Organic Initiative Practice List and National Organic Program Rules Correlation Matrix to determine how conservation practices relate to your organic system. For more information on practices addressing the NRCS resource concern categories of soil quality, soil erosion, domestic animals, plant condition, water quality, and fish and wildlife consult NRCS practice standards. Keep in mind that each state has very specific standards and specifications for why and how practices are implemented before making a payment. Make sure to be clear on what these expectations are and ensure that they will meet your needs. Below are a few examples with links to the national NRCS standards. This practice is used to control erosion, manage pests and nutrients and increase soil organic matter by alternating crops grown in a sequence. It serves as the foundation for improving the soil resource on a farm, and fits well with NOP requirements. This practice is used to control erosion, improve soil quality, manage nutrients, increase biodiversity, and suppress weeds. It can be used in concert with a conservation crop rotation to maximize the resource benefits that can be achieved. This practice is used to control the amount, type, timing and placement of nutrients to support crop production. Nutrient application rates are based on the use of a nutrient balance sheet that determines the crop nutrients needed to produce a realistic yield goal using soil test, manure analysis and accounts for nutrient credits from legumes, composts, etc. This practice is used to prevent and mitigate pesticide and pest suppression related risks to natural resources. While it does not pay for the implementation of IPM, when risks (or potential risks) are identified it can help you develop an IPM plan based on Land Grant University guidance. This practice requires producers to manage their pasture according to a prescribed grazing plan. The plan contains information related to forage quality and quantity and animal numbers to develop a grazing schedule based on a forage-animal balance. It also includes a contingency plan and monitoring activities, and can be used by organic livestock producers to comply with NOP grazing requirments for ruminants. This practice is for the timely cutting and removal of forages from the field as hay, green-chop or ensilage. Harvest is conducted at the proper stage of maturity for planned quality and quantity of forage, and to maintain healthy plants to lessen incidence of disease, insects and weed infestations. To determine program eligibility, discuss conservation options on your farm, and fill out an application contact your local district office. In addition to meeting criteria for the EQIP Organic Initiative, you will need to meet criteria related to the determination of Highly Erodible Land, wetland conservation/compliance and the Adjusted Gross Income determination. To start this process you need to go into your local Farm Service Agency office and get a farm number and tract number.These criteria apply to all USDA programs not just EQIP, so if you have never been in the USDA Service Center before this is the place to start. This takes time and can be a barrier to program enrollment if you are not prepared. For background information on the program, including ranking dates, states contacts, eligible practices, etc visit the NRCS National EQIP Organic Initiative website. Applications for the EQIP program are accepted on a continuous basis, however, NRCS establishes application “cut-off” dates for evaluation and ranking of eligible applications. At the time of application, you will also be provided with a copy of the Contract Appendix, explaining EQIP contract terms and conditions. Review the contract appendix up-front so that you know the contract terms and conditions. Retain copies of all forms and documents that you submit to the NRCS and FSA. Farmer Allen Williams Discusses Pros and Cons of EQIP Organic Initiative from ASAP Illinois on Vimeo. Oregon Tilth’s Organic Conservation Program – includes a number of resources available for producers and agricultural professionals interested in learning more about conservation on organic farms. Live Broadcast: How Can Organic, Non-GMO, and GMO crops coexist? Organic Dairy Certification: Why, How, and What? Join eOrganic for a webinar by Randa Jabbour of the University of Wyoming on new modules she developed for teaching undergraduate students about organic agriculture. The webinar is free and open to the public, and advance registration is required. This webinar will highlight the outputs of a recent NIFA OREI education project focused on developing introductory modules for teaching undergraduate students about organic agriculture. The target audience for this webinar are agricultural educators interacting with students at high school or college levels. Randa Jabbour will discuss the resources created as part of this project and different ways to incorporate them into both online and face-to-face teaching. The lessons within each module are independent of one another, and all components can be “plugged in” to classes as relevant – for example, one could consider using a lesson from the pest management module within an Integrated Pest Management class not specific to organic agriculture. Most resources referenced in these modules are open-access or freely available, and the modules can be downloaded from the website of the Sustainable Agriculture Education Associate (http://www.sustainableaged.org/teaching-resources-library/). Several lessons are built around an original film series “Organic Producer Perspectives” (bit.ly/orgproducer) created as part of this project that consists of interviews with certified organic farmers and ranchers. Join eOrganic for a webinar on new organic grass-fed dairy standards, on April 16 at 2PM Eastern Time, 1PM Central, 12PM Mountain, 11AM Pacific Time. It's free and open to the public, and advance registration is required. Attendees will be able to type in questions for the speakers. This webinar will focus on new grass-fed standards, which are designed for dairy farms that are already certified organic. Presenters will give an introduction to grass-fed dairy farming: what it is, and how it differs from other dairy management systems. Organic standards are set nationally by the USDA; however grass fed dairy labels and standards are newer, and there are several. The standards, as well as some of the accreditation information will be discussed, so that viewers can understand the 3rd party accreditation and certification process. In 2018, eOrganic celebrated its ninth year as the Organic Agriculture Community of Practice of eXtension, at http://www.extension.org. Our goals are to engage farmers, agricultural professionals, and other members of the organic agriculture community with timely and relevant science-, experience-, and regulation-based information in a variety of formats; and to foster a national organic research and outreach community. Through articles, videos, webinars and conference broadcasts, we make organic research available and accessible to the public. A complete list of all eOrganic publications through 2018 is available here. eOrganic launched in 2009 with funding from the USDA NIFA OREI. Since 2011, our work has been funded by subawards on NIFA OREI, ORG and other federal research grants. More than 300 eOrganic members and collaborators have actively contributed to eOrganic by authoring and/or reviewing articles, producing or reviewing videos, answering Ask an Expert questions, presenting webinars, or attending outreach and leadership events. Read about our accomplishments in 2018 and our upcoming plans for the 2019 season. 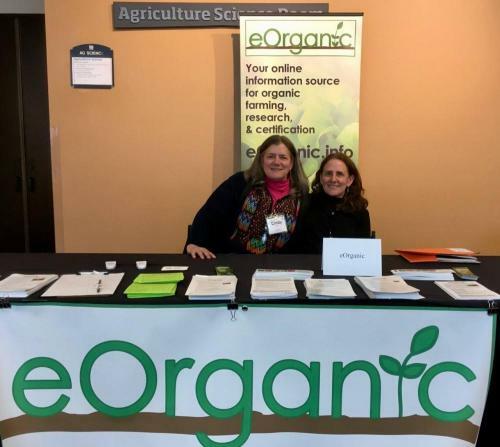 To help spread the word about eOrganic and the resources we provide, we had booths at several farmer events in 2018, including the Organic Seed Growers Conference and the Small Farms Conference at Oregon State University. Special thanks to eOrganic staff member Cindy Salter for staffing the exhibits. For the first time in 2018, eOrganic sponsored a Student Competition and Planned Oral Session at the American Society for Horticultural Science conference along with the ASHS Organic Interest Group. Students submitted an article to be published on eOrganic for the general public about their research, and 5 winners were awarded funding to attend the conference and the opportunity to present their work at the session. In addition, Alex Stone of the eOrganic Leadership Team introduced the participants to eOrganic resources and publishing. The winning articles were published, and due to the success of the event for all involved, another competition was held for the 2019 ASHS conference. In this session, we plan to include a presentation on writing for a farmer audience. To keep researchers, educators, service providers, and farmers aware of our published resources and webinars, as well as other online resources of interest to our community, we publish the eOrganic Updates newsletter. More than 12,000 people received these notices in 2018. In addition, eOrganic maintains an active presence on social media sites such as Facebook, where we have 4600 followers; and Twitter, where we have over 3,000 followers. In 2018, eOrganic pages at extension.org attracted over 599,000 page views. Our YouTube channel attracted over 390,000 views, leading it to surpass 3.1 million views. Since December of 2009, we've offered our popular webinar series, attended by farmers, Extension educators, researchers, organic inspectors and certifiers, nonprofit staff, government agency researchers, master gardeners, and agriculture professionals. These webinars, which contain information on the latest organic research and practical farming techniques, allow people from all over the world to hear a presentation, view the presentation slides, and type in questions—all without having to leave their farms or travel to conferences. Presentations are recorded and made available for viewing at any time from eOrganic's YouTube channel. To date, eOrganic has delivered more than 200 webinars attended by over 23,000 attendees, of which, on average, approximately 30% were farmers. In addition, eOrganic broadcasts selected presentations from national organic conferences live online and archives the presentations on YouTube. 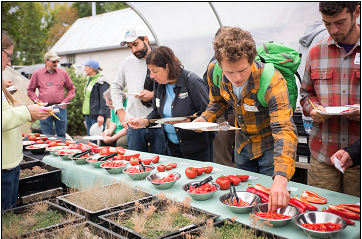 The 2018 season featured 3 days of live presentations from the Organic Seed Growers Conference, as well as 18 webinars on diverse topics such as organic tomato seed production, conducting variety trials, abrasive weeding, organic IPM, and tools for farm biodiversity. Many of the webinars were based on new research from USDA NIFA Organic Research and Extension Initiative and Organic Transitions Program projects. We also collaborated with the Organic Farming Research Foundation on 2 webinar series about soil health and organic farming. We have many more webinars scheduled for 2019 on grass-fed dairy farming, corn breeding, and organic farming practices for soil health. You can find all eOrganic upcoming and archived webinars and live broadcasts at http://www.extension.org/pages/25242. In 2018, 2,450 people attended eOrganic webinars and live conference broadcasts. Across all webinars, approximately 48% responded to post-webinar evaluation surveys. Of these, approximately 29% were farmers, 10% were Extension personnel, 9% were university researchers and educators, 5% were from nonprofits, 12% were agriculture professionals, 9% worked for government agencies, and 5% were organic inspectors or certifiers. Survey respondents' geographic affiliations were: 28% Northeast, 21% Central, 11% South, 22% West, and 18% other named regions or countries. Across all webinars, 97% said the webinars improved their understanding of the topic to some degree, and 3% said "not improved". 74% of respondents planned to apply the knowledge they gained in the webinars a lot or somewhat, 20% said "a little" and 5% said "not at all". 82% said the technical level of the webinars was "just right", 6% thought they were too technical, and 12% thought they were too basic. 79% would recommend the webinars to others, 17% might recommend them, and 4% would not. 97% of respondents thought access to the webinars was easy, 2% said it was somewhat difficult, and 1% said access was very difficult. "I was able to listen to the webinar while working at top dressing my garlic! It was thought provoking to be working in the soil while learning about it." "New to farming, I have struggled to grasp some of the concepts of building and maintaining good soil. The 'light' went on while watching this webinar." "I know next to nothing about organic farming methods. Thank you for providing a free program that is easy to attend. Even after just the introductory lecture, I can see that organic farming is an active process. 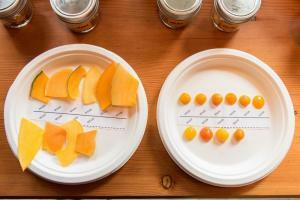 There is more to organic methods than not using chemicals." "Love, love, love the Merlin Bird ID and also the Cool Farm Tool possibilities. I have shared the Merlin Bird ID app with many already." "The material was well presented, and made a good addition to undergraduate curriculum, and I think would be easily understandable for farmers, too." The eOrganic Dairy Team continues to offer its asynchronous online course, "An Introduction to Organic Dairy Production" which was funded by the NIFA OREI project "Development of Technical Training and Support for Agricultural Service Providers and Farmers in Certified Organic Dairy Production Systems" USDA NIFA Organic Agriculture Research and Extension Initiative (OREI) project. Course developers and instructors included: Cindy Daley and Audrey Denney, California State University-Chico; Heather Darby and Deb Heleba, University of Vermont Extension; Sarah Flack, Sarah Flack Consulting; Sid Bosworth, University of Vermont; and Karen Hoffman, USDA NRCS. The course is composed of 10 modules addressing a range of topics related to certified organic dairy production, including certification, soil health, pasture and forages, herd health and nutrition, milk quality, and calf management. Each module has required readings, a narrated PowerPoint presentation from an expert on the topic, and recommended additional resources. CCA CEUs are available. Find a full description and a link to the course at http://www.extension.org/pages/69299. In 2018, the eOrganic dairy team published a second online course. "On the Ground: A Closer Look at Organic Dairy Pasture, Forages, and Soils" is a self-directed online course designed for Extension educators and other agriculture service providers, as well as farmers and students who want to move beyond the basics and better understand how healthy soils lead to healthy livestock feeds. It is a follow up to "An ﻿Introduction to Organic Dairy Production", which is a prerequisite for taking this course. Find it here. All eOrganic articles can be found at www.extension.org/organic_production. Before publication, every article is subject to two anonymous peer reviews and National Organic Program compliance review. In 2018, eOrganic is worked with over 20 USDA NIFA funded research and outreach projects. eOrganic supports these groups in diverse ways, including technical support for the development of articles and videos, peer-refereed and NOP-compliance review, video production training and editing, web conferencing, conference broadcasting, or workspaces for project management. For 17 projects, eOrganic hosts public websites where you can learn about the project goals and personnel, and find results and reports as they become available. Biocontrol Tactics for Key Vegetable Insect Pests in the Southeastern U.S.
eOrganic also hosts the following special websites: an organic variety trial database to which users can upload trial reports, which was created with the NOVIC project, and the Organic Seed Alliance, and a gallery of colorful and nutritious organic carrot varieties in development for the Carrot Improvement for Organic Agriculture project. If you have trial results to share and are interested in participating in the Organic Variety Trial Database, please contact Jared Zystro of the Organic Seed Alliance. Ask an Expert is a free service that anyone can use to get answers to questions from Land Grant University (LGU) and Extension professionals through eXtension.org. Ask your question at https://ask.extension.org/groups/1668/ask—you can even submit an image to help with a diagnosis. eOrganic is a Community of Practice, which means it relies on community members like you to help it grow and better serve our farmer and agricultural professional stakeholders by developing and delivering critical and timely resources. If you are a researcher or Extension educator with expertise in organic agriculture, eOrganic wants you to write an article, shoot a video, deliver a webinar, or develop and teach an online course. All of our articles and videos undergo NOP-compliance and peer review before publication. For more information on how to get involved with eOrganic, join eOrganic at http://eorganic.info or contact Alice Formiga at alice.formiga@hort.oregonstate.edu. Since 2011, eOrganic has partnered with 65 grant funded organic agriculture research projects. For complete information on the diverse opportunities eOrganic offers project groups and how to write eOrganic into your proposal, visit http://eOrganic.info/proposal. During the past year, eOrganic received subawards from over 20 NIFA OREI and ORG projects as well as Beginning Farmer, WSARE and Risk Management proposals. We can also partner with you on regional IPM, AFRI, SARE, NRCS-CIG and proposals from other funding sources. A 2-page handout describing our services to funded projects, which can be distributed at meetings, can be found here. Analytics information for reporting on your articles, videos, webinars and courses. Evaluation for webinars and conference broadcasts. About the Course On the Ground: A Closer Look at Organic Dairy Pasture, Forages, and Soils is a self-directed online course designed for Extension educators and other agriculture service providers, as well as farmers and students who want to better understand certified organic dairy farming. It is a follow up on eOrganic's An Introduction to Organic Dairy Production which is a pre-requisite for taking this course. The modules, described below, will help participants better understand the connections between the health of an organic dairy farm’s soils, the health and nutrition of pastures and stored forages, and ultimately, the health of livestock. Each module combines readings, narrated presentations, and recommended resources; all materials have undergone peer review and certification checks to ensure high quality, accurate certified organic information. This article summarizes publicly available data on efficacy of commercially available, EPA-registered biochemical biopesticides for plant disease control. For a more detailed introduction see the related eOrganic article Biopesticides for Plant Disease Management in Organic Farming. At the time of writing, these products were allowed for use on organic farms. However, products and their status for use on organic farms change, so before using any of these products, be sure to (1) read the label to assure that the product is labeled for the crop you intend to apply it to and the disease you intend to control, (2) read and understand the safety precautions and application restrictions, and (3) make sure that the brand name product is listed in your Organic System Plan , approved by your certifier AND registered for legal use in your state. For more information on how to determine whether a disease management product can be used on your farm, see the eOrganic article Can I Use this Product for Disease Management on my Organic Farm? The efficacy ratings presented here are based on the results of one-year field studies published between 2000 and 2009 in the Plant Disease Management Reports (PDMR) (http://www.plantmanagementnetwork.org/). The ratings are based on a comparison between untreated controls and the application of each product independently. These studies were not, in general, conducted on organic farms or on organically-managed land. Plant Management Network International. Plant disease management reports [Online]. American Phytopathological Society. Available at: http://www.plantmanagementnetwork.org/pub/trial/pdmr/ (verified 20 Aug 2010). The Organic Agriculture Research Forum, organized by the Organic Farming Research Foundation, was held at the Organicology Conference in Portland, Oregon on February 16, 2019. The day-long forum and poster session featured innovative presentations from researchers on organic farming and food systems. eOrganic attended the conference and recorded the presentations. Late blight is a serious disease of potato family (Solanaceous) crops worldwide, caused by the pathogen Phytophthora infestans. Late blight is favored by high humidity, dew, wet weather and moderate temperatures (50 to 80°F). When the environment is favorable, the disease can spread quickly and can defoliate fields within 3 weeks. Late blight affects foliage of both potato and tomato as well as potato tubers and tomato fruit. Late blight is a very difficult disease to manage organically. Organic farmers should employ all strategies available to reduce late blight risk in host crops. The first steps in managing any pest are 1) identifying it when you encounter it in the field, and 2) understanding its life cycle so you can exploit its weaknesses. For more information on Phythophthora infestans/late blight diagnostics and life cycle, see the Michigan State (Kirk et al., 2004) Extension bulletin referenced at the end of this article. 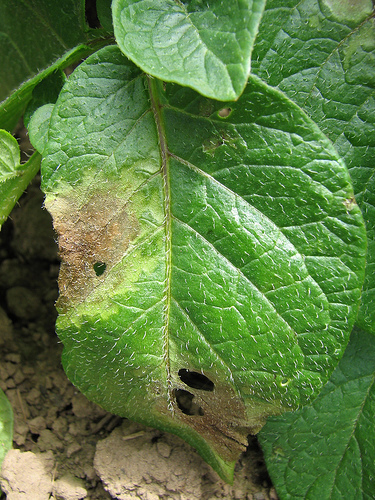 Late blight lesions on a potato leaf. Photo credit: Lane Selman, Oregon State University. In most areas of the US, the late blight pathogen is an obligate parasite, meaning that it can only survive in living plant tissue. Therefore, destruction of all living hosts of the pathogen is an important control strategy. This means destroying all cull piles and volunteer hosts (potato, tomato, eggplant, pepper), including hairy nightshade. Waste potatoes can be fed to animals, buried 2 feet deep, composted, or spread on the surface of the soil to be frozen during the winter months. Volunteer potatoes and tomatoes should be removed by cultivation. Choose fields with good air movement and well drained soils. Do not plant susceptible crops in fields: 1) in which host plants may volunteer/grow (volunteer seedlings of host crops or weeds/hairy nightshade); 2) next to cull piles of tomatoes or potatoes; or 3) shaded by trees or structures. By law, certified organic farmers must buy certified organically-grown seed if available. Potato: Phytophthora infestans, the pathogen that causes late blight, is easily transmitted by diseased potato tubers. Planting potato seed that you have saved or obtained from neighbors increases late blight risk. Purchase certified seed potatoes (potato SEED certification, not organic certification) from high quality sources. Certified seed is not guaranteed to be late-blight free, but in general, certified seed should be less risky because certified seed production is monitored by seed professionals and certified growers tend to be well informed about significant potato pests affecting seed quality. Inspect your seed potatoes for late blight symptoms upon arrival, and if seed is stored before planting, inspect it again before planting as late blight can spread during storage. If late blight is suspected, have diseased tubers diagnosed by a crop consultant or plant disease diagnostician. Do not plant infected tubers as they are an excellent source of primary (initial) inoculum to start an early epidemic. On organic farms, early epidemics have a high likelihood of destroying the entire crop. Tomato: The late blight pathogen is NOT transmitted by tomato seed. Potato: There are a few potato cultivars available in the US that have moderate to strong foliar (and tuber) late blight resistance: Defender (russet, brown skin and white flesh; Novy et al., 2006); Jacqueline Lee (round, yellow skin and flesh; Douches et al., 2000); and Ozette (fingerling, white skin and flesh; Vales and Yilma, 2007). All three of these potato cultivars were highly rated for marketability and flavor when grown on fresh market organic farms in western Oregon and Washington (OSPUD project). US plant breeders are focusing on the development of late blight resistant potatoes; new resistant cultivars should be available in the near future. Tomato: There are some commercially available tomato cultivars with resistance in tomato to late blight. As described above for potatoes, US breeders are in the process of developing new disease resistant tomato cultivars. Defender, a russet potato bred by University of Idaho, and Jacqueline Lee, a round, yellow-fleshed potato bred by Michigan State University. 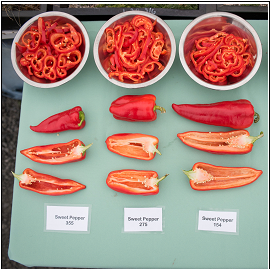 Defender and Jacqueline Lee were highly rated for productivity and flavor when grown on fresh market organic farms in Oregon and Washington (OSPUD). Photo credits: Lane Selman, Oregon State University. Manipulation of planting date to manage late blight will depend on local conditions and risk periods. In areas where the highest likelihood of late blight onset is late in the season, plant short season varieties early so foliage has died back before high risk periods begin. If risk is highest during the spring, plant later to avoid spring epidemics. If risk occurs throughout the growing season, planting timing is unlikely to reduce disease risk. However, spacing planting dates from early to late might help spread risk across plantings. Spatially separating plantings will reduce the risk of late blight spread from planting to planting. Late blight epidemics are much more likely to occur during periods of extended leaf wetness. Therefore, production of tomatoes in high tunnels with drip irrigation should dramatically reduce late blight risk by eliminating the contribution of rain and overhead irrigation to leaf wetness. Potatoes are not typically grown in protected culture, but if late blight is a serious problem and the crop has high value (specialty potatoes, retail market), protected culture might also have merit as a potato late blight management strategy. Make sure to ventilate greenhouses and high tunnels to minimize leaf wetness. Plant in wide rows oriented with the prevailing winds to promote good air movement and reduce leaf wetness. Intercropping could reduce late blight risk. The BlightMOP project reported that intercropping potatoes with non-host crops (rows planted perpendicular to the prevailing winds) showed some potential to reduce disease spread in infected fields in European Union research trials (Leifert and Wilcockson 2005). In addition, intercropping rows of resistant and susceptible potato cultivars, as well as planting mixed seed of resistant and susceptible cultivars, also reduced disease severity in some trials. Stake and prune tomatoes to promote air movement and reduce leaf wetness. Do not stake and prune when wet, as diseases can be spread by people and tools. High hilling, and prevention of crack development in hills, can reduce the movement of late blight spores through the soil to tubers, thereby reducing tuber late blight risk. Manage irrigation to minimize the duration of leaf wetness. In many regions of the country, foliage becomes wet from dew during the early morning hours. If this occurs in your production area, irrigate during the early morning hours so the irrigation coincides with the leaf wetness period contributed by dew. Alternately, irrigate during the middle of the day, so the foliage goes through a drying period early in the morning and again before dark. Do not irrigate in the afternoon if the foliage cannot dry before dark; wet foliage at dark will typically remain wet all night long, resulting in a very long wetting period and increased disease risk. If applicable, use drip irrigation to minimize irrigation-applied leaf wetness. Do not oversupply nitrogen to the crop, either through high rates of soil nitrogen mineralization and/or organic fertilizer applications. High N plants produce fewer tubers (potatoes) or fewer fruits (tomatoes) and also produce a large, lush canopy. Large, lush canopies dry slowly after wetting, increasing the risk of late blight infection. In addition, high N plant tissue is more susceptible to infection than low N plant tissue. Weeds in the field impede airflow, so manage weeds. Volunteer tomatoes and potatoes, and the weed hairy nightshade, are hosts to late blight, so specifically eradicate these plants in your fields. As an organic farmer you may wonder whether scouting is of any value, as most late blight management strategies available must be in place BEFORE late blight is observed. However, scouting is of value for several reasons: 1) You will know whether or not you have late blight in a specific field. If you DON'T have late blight in a field, you will not have to take precautions before, during and after harvest, and in subsequent years in that and neighboring fields, to minimize late blight survival and spread. 2) If first symptoms are detected immediately, the few reactive management strategies available to you could be employed, such as destruction of plants, more frequent copper applications, more strict irrigation management, or if the crop is close to harvest, immediate foliage destruction and subsequent crop harvest. Copper products can effectively control, or slow down, late blight epidemics. Copper products have no "kick-back" activity. Therefore, they need to be applied to all plant surfaces before infection (before symptoms are observed in the field) and frequently so new foliage is protected as plants grow. In addition, they must be applied so ALL plant surfaces are covered, including the undersides of leaves where Phytophthora infestans sporulates (makes the spores that cause infections). Compost teas and other non-copper materials may have some efficacy. For more information see Organic Management of Late Blight of Potato and Totato with Copper Products. NOTE: Before applying ANY copper product, be sure to 1) read the label to be sure that the product is labeled for the crop you intend to apply it to and the disease you intend to control, and 2) make sure that the brand name product is listed your Organic System Plan and approved by your certifier. For more information see Can I Use this Product for Disease Management on my Organic Farm? Some studies have shown that destroying the first diseased plants in a field can stop or slow disease movement throughout the rest of the field. It takes approximately three days to one week (depending on environmental conditions) from infection of a plant by the pathogen to development of symptoms. During that period, more infections are initiated on neighboring plants. Therefore, by the time the first infected plants show symptoms, many neighboring plants are infected as well. As the result, many apparently healthy plants must be destroyed in the area surrounding the first symptomatic plants in order to destroy infected, non-symptomatic plants. Michigan State University research suggests that, under Michigan conditions, all plants in a 100 ft radius from the first symptomatic plants must be destroyed (Kirk et al., 2007). A rigorous scouting program must be in place to detect the very first late blight symptoms in a field in order to make plant destruction effective. In small fields, too many plants may have to be destroyed for this to be an effective management strategy. Another strategy is to destroy ALL foliage in a diseased field to prevent spread of the disease to other plants and tubers, or to neighboring fields. For potatoes, destruction of all foliage in the field is only recommended during later stages in tuber bulking, as tubers will cease growth when the foliage is dead. Potato: Let plants die back completely before harvest. In most areas of the US, the late blight pathogen is an obligate parasite, meaning that it can only survive in living plant tissue. Therefore, killing the potato foliage also kills the pathogen living in that foliage. Dieback can be encouraged in several ways. First: don't overfertilize with nitrogen. Low N status encourages die-back, as well as minimizes N losses from the decomposing potato foliage after harvest. Second: flail, spray out (with approved herbicides - check with your certifier), or burn any living foliage. Once vines are dead, wait two weeks before harvesting the tubers to ensure that the pathogen is not longer viable in the foliage and all diseased tubers are fully decomposed; these measures should minimize disease spread. Do not harvest tubers when wet, as moisture increases the risk of spreading pathogen propagules. Harvest diseased tubers separately from healthy tubers to minimize disease spread. Late blight can spread during storage, so cull diseased tubers from diseased lots before storage. Destroy all culls. Tomato: Do not harvest when foliage is wet, as the pathogen sporulates during periods of leaf wetness and spores can move with people, tools and equipment from plant to plant and field to field. Cull and destroy diseased plants and fruits - do not leave them lying in the field or greenhouse. Potato: Store tubers from diseased fields separately from tubers from healthy fields. Potatoes should be stored dry and at the lowest temperature possible to suppress pathogen growth and spread. Scout all stored potatoes frequently and remove diseased tubers from storage to prevent disease spread. Destroy culls. Tomato: Cull diseased tomatoes and destroy the culls. Do not store tomatoes harvested from diseased fields with tomatoes from healthy fields, as disease can spread during storage. Dillon, M., J. Navazio, K. Dean, M. Rosemeyer. 2008. Public breeding for organic agriculture: Screening for horizontal resistance to late blight in tomatoes [Online]. Organic Farming Research Foundation Report. Available at: http://ofrf.org/sites/ofrf.org/files/docs/pdf/ib16.pdf (verified 18 March 2010). Douches, D., K. Jastrzebski, J. Coombs, W. Kirk, K. Felcher, R. Hammerschmidt, R. Chase. 2001. 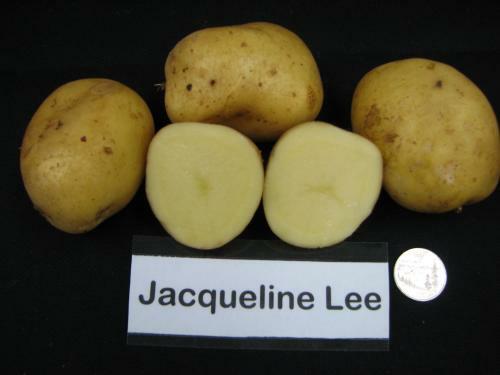 Jacqueline Lee: A late-blight-resistant table stock variety. American Journal of Potato Research 78 (6):413-419. (Available online at: https://www.msu.edu/~douchesd/releases/JacquelineLee_info.pdf) (verified 18 March 2010). Fry, W.R. 1998. Late blight of tomatoes and potatoes [Online]. Cooperative Extension of New York State Cornell University. Ithaca, NY. Available at: http://vegetablemdonline.ppath.cornell.edu/factsheets/Potato_LateBlt.htm (verified 18 March 2010). Inglis, D., B. Gundersen, and M. Derie. 2001. Evaluation of tomato germplasm for resistance to late blight, 2000. Biological and Cultural Tests for Control of Plant Diseases 16:PT77. Inglis, D., B. Gundersen, M. Derie, E. Vestey. 1999. Evaluation of tomato cultivars for resistance to late blight, 1998. Biological and Cultural Tests for Control of Plant Diseases 14:117. Kirk, W., P. Wharton, R. Hammerschmidt, F. Abu-el Samen and D. Douches. 2004. Late Blight [Online]. Michigan State University Extension Bulletin E-2945. East Lansing, MI. Available at: https://www.canr.msu.edu/resources/michigan_potato_diseases_late_blight_e2945(verified 18 March 2010). Leifert, C. and S. J. Wilcockson. 2005. Blight-MOP: Development of a systems approach for the management of late blight (caused by Phytophthora infestans) in EU organic potato production [Online]. University of Newcastle, UK. Available at:http://www.coreorganic.org/library/EU_folder/blight-mop.pdf (verified 4 April 2011). Novy, R., S. Love, D. Corsini, J. Pavek, J. Whitworth, A. Mosley, S. James, D. Hone, C. Shock, K. Rykbost, C. Brown, R. Thomton, R. Knowles, M. Pavek, N. Olsen, and D. Inglis. 2006. 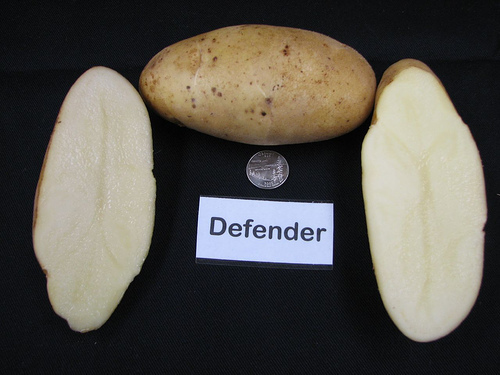 Defender: A high-yielding, processing potato cultivar with foliar and tuber resistance to late blight. American Journal of Potato Research 83 (1): 9-19. Plant Variety Management Institute. 2008. Defender [Online]. Available at: http://www.pvmi.org/Storage/General/Defender%20Flyer%205%2008.pdf (verified 18 March 2010). Rowe, R., S. Miller, and R. Riedel. Undated. Late blight of potato and tomato. Ohio State Extension Bulletin HYG-3102-95. Columbus, OH. Powelson, M., R. Ludy, H. Partipilo, D.Inglis, B. Gunderson, M. Derie. 2002. Seedborne late blight of potato [Online]. Plant Management Network. Available at: http://www.plantmanagementnetwork.org/pub/php/management/potatolate/ (verified 18 March 2010). Selman, L., N. Andrews, A. Stone, and A. Mosley. 2008. What's wrong with my potato tubers [Online]? Oregon State University Extension Bulletin EM 8948-E. Corvallis, OR. Available at: http://ir.library.oregonstate.edu/xmlui/bitstream/handle/1957/20496/em8948-e.pdf (verified 18 March 2010). Warren, G. 2008. A potato with a past: Makah Ozette. The Slow Food USA Blog. Available at: https://www.slowfoodusa.org/blog-post/a-potato-with-a-past-the-makah-ozette (verified 18 March 2010). March 27, 2019: Breeding New Cultivars for Soil-enhancing Organic Cropping Systems in the Western Region, by Mark Schonbeck, OFRF. This webinar will summarize plant breeding endeavors toward improved vegetable, specialty grain, and other crop cultivars for organic producers in the Western Region, and practical resources to help organic producers obtain the best available seed varieties for their needs. We will also explore emerging opportunities to develop new cultivars for nutrient and moisture use efficiency, competitiveness toward weeds, and enhanced interactions with beneficial soil biota. Register. April 10, 2019: Corn Breeding for Organic Markets, by Martin Bohm and Bill Davison of the University of Illinois and Walter Goldstein of the Mandaamin Institute. This webinar will explore how different breeding styles and methods can be used to develop corn varieties that meet the diverse needs of organically produced grain and perform well under a variety of growing conditions and farming practices. Find out more and register here. These new Quick Reference Vegetable Seed Production Guides are available from the Organic Seed Alliance. Funding for these guides was provided by the Montana Department of Agriculture’s Specialty Crop Block Grant Program. A new NIFA OREI project was funded which will be working toward the long-term goal of increasing and conserving natural enemies in organic tomato and cucurbit production in the southeastern US. The production of these crops in the Southeast is limited by three key pests: twospotted spider mite (TSSM), sweetpotato whitefly (SWF) and thrips (most notably the western flower thrips and the tobacco thrips). The researchers, who are a team of scientists and educators from Florida, Georgia, and the Carolinas, will be looking at ways to improve the management of these pests with predatory mites and other natural enemies. As the project progresses, they will be posting updates on their website and conducting webinars through eOrganic. The project is being led by Dr. Juang Chong of Clemson University. Find out more about the project on their website here. A new NIFA OREI funded project on grass-fed dairy production was funded starting in 2018. The project, Advancing Grass-Fed Dairy: A Whole Systems Approach to Enhancing Productivity, Quality, and Farm Viability in the US. ct, is led by Dr. Heather Darby at the University of Vermont along with a team of farmers, consultants and researchers from several states. This multi-disciplinary research team hopes to identify critical components of grass-fed dairy management that support high quality milk production, herd health, environmental health, and farm economic viability while contributing to a vibrant grass-fed dairy market that meets the needs and preferences of consumers.The researchers mailed out a survey to 300 grass-fed producers but if you are a grass-fed dairy producer and did not receive the survey and would like to participate or be added to the project mailing list, contact Meredith Niles at the University of Vermont: mtniles@uvm.edu. If you are a gardener, you may be interested in another webinar by Cary Rivard about grafting for home gardeners: Demystifying Grafted Tomatoes: The Why & How for Gardeners, which is part of the 2019 series of Advanced Training Webinars for Master Gardeners sponsored by Oregon State University Extension. Find out more information and register here. Recordings and proceedings from all the presentations at the 2019 Industrial Hemp conference are being offered on the eXtension Campus website as a course. These materials are geared toward aspiring and practicing industrial hemp growers and interested ag service providers, including Extension educators. As a result of watching these online proceedings and recordings, participants will learn about latest research results, production information, regulatory requirements for Vermont, and resources on industrial hemp production. The program of the conference, which took place on February 8, 2019 in Burlington, VT, is available here, the course is available here and costs $75. If you attended the conference in person, there is no charge to access the materials, and you can contact Susan Brouillette at the University of Vermont for a vendor code. The conference was organized by the University of Vermont Extension Northwest Crop & Soils Program and the Vermont Agency of Agriculture, Food and Markets. Hybrid, F1, Double Cross, and Open-pollinated Corn: What Does it All Mean? Join us for an eOrganic webinar on breeding corn for organic markets! The webinar takes place on April 10, 2019 at 11AM Pacific, 12 Mountain, 1 Central, 2 Eastern Time. It's free and open to the public, and advance registration is required. Our long love affair with maize continues with efforts to develop varieties that perform well in organic farming systems. Breeders and grain users of all sorts will benefit from a webinar discussing breeding styles for maize. Martin Bohn, Maize geneticist at the University of Illinois, will share how the University’s elite parent lines can efficiently be used to develop food grade materials for organic markets. Walter Goldstein, President of the Mandaamin Institute, will explain how for over a decade, he has been developing high-lysine and nitrogen use efficient hybrids for organic feed markets. Bill Davison, Extension Educator at the University of Illinois will explain how mass selection and participatory efforts are being used to develop open-pollinated varieties for a variety of specialty applications. Organic farming relies on a systems approach to crop production and pest management that consists of more than simply substituting natural inputs for ones that are synthetically produced. Organic production practices must maintain or improve the natural resources of an operation, including soil and water quality. Organic farmers must develop a system of cultural, biological, and/or genetic strategies in a comprehensive disease management program, and describe this program in the Organic System Plan, before applying a pesticide as a control measure. However, in some cases, materials for disease management must be applied to control difficult problems such as potato late blight or peach leaf curl. In these cases, how can a farmer determine what materials are allowed for disease management on her or his certified organic farm? Under the National Organic Program rule, synthetic substances are generally prohibited, with exceptions that appear on the National List. Natural substances are allowed unless they appear as prohibited on the National List. This requirement applies to all substances, not just to active ingredients. Only minimum-risk inert ingredients are permitted in formulations used in organic production. Naturally occurring microorganisms, plant extracts, and mined minerals may also be used to prevent diseases. When preventive practices and non-synthetic materials are insufficient to prevent or control diseases, allowed synthetic materials may be used. The conditions requiring such use must be documented in the Organic System Plan (OSP). The OSP should include a clear threshold or decision rule for when a synthetic pesticide is to be applied, and a system to monitor its use. The Accredited Certifying Agent (ACA) needs to approve the OSP before the farm is certified as organic. If a farm uses a pesticide that is not on the OSP for a use already approved by the certifer, that farm may lose its certification. According to the Organic Farming Research Foundation organic farmer survey, sulfur and copper are the first- and second most-applied disease control materials on organic farms, with 40% and 34% of responding farms reporting their use, respectively. Fixed coppers exempted from the requirement of a pesticide residue tolerance by EPA can be applied as long as they are used in a way that minimizes copper accumulation in the soil. Among those that are allowed include specific formulations of copper sulfate, copper hydroxide, copper octanoate, copper oxide, and copper oxychloride. Bordeaux mix (copper sulfate combined with hydrated lime) and lime-sulfur are also permitted. Narrow range oils used as dormant, suffocating, and summer oils can be used for disease and insect pest management. Hydrogen peroxide and potassium bicarbonate, two familiar substances that are relatively new as fungicides, are also permitted. Finally, growers whose crops are infected with fire blight can use peracetic acid. Antibiotics are no longer permitted for fire blight control. For information on non-antibiotic control of fire blight, see the eOrganic articles Fire Blight Control for Organic Orchards: Moving Beyond Antibiotics and Organic Fire Blight Management in the Western US. In some cases, materials can be used for some uses but not others, so make sure that the product is permitted for the use you intend. Hydrated lime can be used for disease control, but not as a soil amendment. At present, peracetic acid cannot be used to treat seed potatoes. Some materials often thought of as natural are considered synthetic under the NOP because of the way they are manufactured. For example, sulfur is listed as an allowed synthetic input because much of the sulfur used in agriculture comes from the scrubbers on the smokestacks of petroleum and natural gas refineries. Therefore, sulfur falls under the definition of synthetic due to the chemical reaction occurring in the scrubbers. Non-active or inert ingredients are classified according to the level of toxicological concern. The EPA has changed how it lists inert ingredients, and the NOP has taken over the maintenance of the list of substances used as inert ingredients that the EPA determined to be of minimal concern prior to 2004. To be NOP compliant, all synthetic inert ingredients in pesticides must be classified as minimum risk, appear specifically on the National List or are used in passive pheromone dispensers. Inert ingredients do not appear on labels, so verifying compliance with this annotation requires the cooperation of the pesticide registrant. ACAs can contact the manufacturer to obtain disclosure of the contents of the product and verify that they all comply. ACAs may consult with another ACA that has reviewed the information and accept their determination that the material is NOP compliant. ACAs may consult with a reputable third party source such as the Environmental Protection Agency (EPA) or the Organic Materials Review Institute (OMRI) that reviews materials for compliance with the NOP regulations. ACAs must document their determinations and verify that the inputs are used according to the standards. ACAs must either have the capacity and expertise to review products or contract with organizations accredited do so. Many ACAs contract with OMRI, a non-profit initially established by certifiers specifically for that purpose. The Washington State Department of Agriculture (WSDA) also reviews products according to the NOP and publishes a list of brand name products that other ACAs use. The OMRI and WSDA lists are both online. These lists are not comprehensive, so there may be other brand name products that can be used. However, in order to be sure that a product complies, the manufacturer must fully disclose all ingredients and manufacturing processes to an ACA or a third party contracted by the ACA. All ingredients must comply with the standards described above. when in doubt about the status of an input, certification applicants and certified producers should check with their certifiers before purchasing or applying the substance, and get the approval in writing. The OSP is part of the application form and includes any updates provided to the ACA, who can help by providing sample forms. The OSP is the basis of the record keeping system that is reviewed during the certification process. If allowed synthetic inputs are used, it is especially important to describe preventive disease management strategies in the OSP in order to help demonstrate that these pesticides are only used when preventive methods are insufficient to manage disease. The NOP requires that all inputs used and planned for use must be included in the OSP and be reviewed and approved by the ACA before use. When the inspector visits, product labels are sometimes sufficient to demonstrate NOP compliance of a brand name product. For example, if using sulfur or a microbial product, the label indicates that the active ingredient is allowed for disease control. If the product is OMRI or WSDA listed, the label should be sufficient proof for the inspector to verify that the brand name product meets the NOP standard. If a product is not OMRI or WSDA listed, the label will help to verify whether active ingredients are allowed. However, the farmer or ACA must have a disclosure from the manufacturer that all ingredients, including the inerts, meet NOP requirements. In addition to labels, producers should keep copies of purchase receipts and shipping invoices for all purchased inputs. Producers and ACAs must maintain these records for five years. Pesticide application records must be maintained. These are also reviewed during inspections. They can be kept in whatever form is adapted to the farm, but they must be sufficient to demonstrate compliance with the NOP. Normally a record of the material used and the date, rate, and location of application is sufficient. In the case of copper materials, pesticide application records can help verify whether copper products are applied in a manner to minimizes soil accumulation of copper. See the related article Organic Management of Late Blight of Potato and Tomato with Copper for more information. Evaluate each label ingredient for compliance with the NOP and any annotations in the National List. The OMRI Generic Materials List may also be a helpful guide. If the active is allowed, contact the manufacturer and request all the ingredients in the formula. Make sure all of the ingredients are on the USDA's list of permitted inert ingredients. Document that all the annotations, or NOP restrictions associated with use of the material, are met. Be sure to contact your ACA if you have any doubt about the NOP compliance of a material. If they do not contract with OMRI or WSDA, they may require the information directly from the manufacturer. The NOP regulation defines "synthetic" as, "A substance that is formulated or manufactured by a chemical process or by a process that chemically changes a substance extracted from naturally occurring plant, animal, or mineral sources, except that such term shall not apply to substances created by naturally occurring biological processes." Coppers, fixed - copper hydroxide, copper oxide, copper oxychloride, includes products exempted from EPA tolerance, provided that copper-based materials must be used in a manner that minimizes accumulation in the soil and shall not be used as herbicides. Copper sulfate - Substance must be used in a manner that minimizes accumulation of copper in the soil. Oils, horticultural, narrow range oils as dormant, suffocating, and summer oils. Peracetic acid—for use to control fire blight bacteria. EPA List 3 – Inerts of Unkown Toxicity – for use only in passive pheromone dispensers. Calcium chloride, brine process is natural and prohibited for use except as a foliar spray to treat a physiological disorder associated with calcium uptake. Potassium chloride—unless derived from a mined source and applied in a manner that minimizes chloride accumulation in the soil. Sodium nitrate—unless use is restricted to no more than 20% of the crop’s total nitrogen requirement. Agricultural Marketing Service National Organic Program [Online]. Available at: http://www.ams.usda.gov/nop (verified 10 March 2010). Agricultural Marketing Service Regulations [Online]. Available at: http://www.ecfr.gov/cgi-bin/text-idx?c=ecfr&sid=3f34f4c22f9aa8e6d9864cc2683cea02&tpl=/ecfrbrowse/Title07/7cfr205_main_02.tpl (verified 31 August 2012). National Organic Program — Submission of Petitions of Substances for Inclusion on or Removal From the National List of Substances Allowed and Prohibited in Organic Production and Handling [Online]. Agricultural Marketing Service United States Department of Agriculture. Washington, D.C. Available at: http://www.ams.usda.gov/AMSv1.0/getfile?dDocName=STELPRDC5048809&acct=nopgeninfo (verified 10 March 2010). OFRF Fourth National Organic Farmers' Survey: Sustaining Organic Farms in a Changing Organic Marketplace. Waltz, E. 2004. Organic Farming Research Foundation. Santa Cruz, California. Available at: http://www.ofrf.org/sites/ofrf.org/files/docs/pdf/4thsurvey_results.pdf (verified 10 March 2010). Organic Materials Review Institute [Online]. Available at: http://www.omri.org/ (verified 10 March 2010). Organic Production and Handling Standards [Online]. 2008. Agricultural Marketing Service United States Department of Agriculture. Washington, D.C. Available at: http://www.ams.usda.gov/AMSv1.0/getfile?dDocName=STELDEV3004445&acct=nopgeninfo (verified 10 March 2010). Verification of Materials [Online]. B. Robinson, and M. Bradley. 2008. Agricultural Marketing Service United States Department of Agriculture. Washington, D.C. Available at: http://www.ams.usda.gov/AMSv1.0/getfile?dDocName=STELPRDC5066877&acct=nopgeninfo (verified 10 March 2010). Washington State Department of Agriculture's Organic Program [Online]. Washington State Department of Agriculture. Available at: http://agr.wa.gov/FoodAnimal/Organic/ (verified 10 March 2010). Cary Rivard is an Associate Professor and Director of the Kansas State University Olathe Horticulture Center. His research program focuses on vegetable production in high tunnels and he oversees the www.hightunnels.org website. There's still time to register for these free online learning opportunities! All eOrganic webinars take place at 11AM Pacific Time, 12 Mountain, 1 Central, 2 Eastern.